The City of Burlington is committed to maintaining a high calibre program of public artworks. 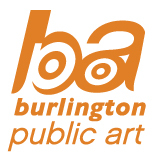 Artwork or funds donated to the City must fit with the guiding principles of the Public Art Master Plan (PAMP) and adhere to the City of Burlington’s Donation Policy. As such, specific aesthetic and technical criteria must be met and all proposed donations will be reviewed by either an internal staff team, independent jury or Council (depending on the value of the proposed donation). An overview of the review process can be found here: Public Art Donation Review Process. The first step in the donation process is to submit a Public Art Donation Form. Please contact Kim Selman prior to filling out this form to discuss your donation proposal.